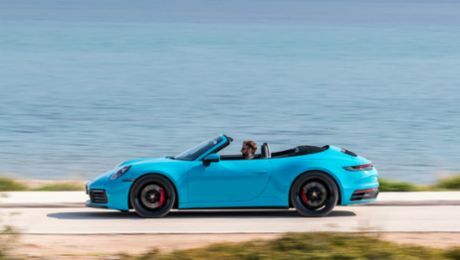 Its 368 kW (500 hp, 911 R: Combined fuel consumption 13.3 l/100 km; CO2 emissions: 308 g/km) four-litre naturally aspirated flat engine and six-speed manual sports transmission places the 911 R firmly in the tradition of its historic role model: a road-homologated racing car from 1967. Produced as part of a limited production series, the 911 R (R for Racing) performed in rallies, in the Targa Florio and in world record runs. Like its legendary predecessor, the new 911 R relies on systematic lightweight construction, maximum performance and an unfiltered driving experience: this special limited-edition model of 991 units has an overall weight of 1,370 kilograms and is currently the lightest version of the 911. The driver sits in a carbon full bucket seat with fabric centre panels in Pepita tartan design, recalling the first 911 in the 1960s. An “R-specific” GT sport steering wheel with a diameter of 360 millimetres receives steering commands from the driver. Gearshifts take place in traditional manner via an R-specific short gearshift lever and the clutch pedal. Carbon trim strips in the interior with an embedded aluminium badge on the front passenger's side indicate the limited number of the 911 R. A typical feature of GT vehicles are the pull straps as door openers. At the Geneva Motor Show it has been attracting great attention – and also in the media.